Sit on the America for the first time and you are immediately struck by the sheer size of the bike. 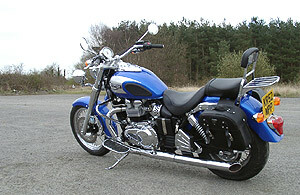 It feels quite large and very spacious with the wide bars, low seat and a larger tank than the standard Boneville. This gives the America a completely unique look and feel, and with the numerous accessories our test bike had fitted it had a very American feel to it. Turn the key, which is behind your left leg, push the start button and the motor fires up emitting a totally different sound to it from the other parallel twins. So what has Triumph done here then? The biggest internal change is a switch from the Bonneville's 360-degree crankshaft arrangement (where the pistons go up and down together, alternating power strokes) to a 270-degree crankshaft (where the rods are set 270 degrees apart on the crankshaft), this changes the sound and feel of the engine. A bit of juggling was required with the gear-driven counterbalancers and the camshafts to improve low-rpm power slightly and that helps the America produce 90% of its torque as early as 2750rpm. 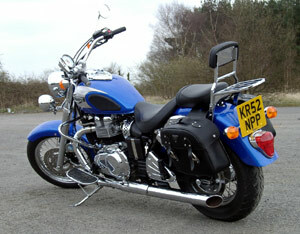 The America retains the same claimed 62 bhp (at 7400 rpm) and peak torque of 44 ft-lb (at 3500 rpm) as the standard Bonnie. The internal gearing remains unchanged, although the final drive ratio was raised slightly to reduce rpm and create a more relaxed riding manner. 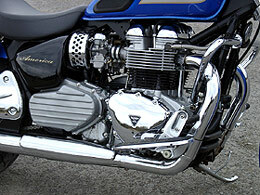 The 35mm carbs were given slightly revised jetting, but retain the anti-icing electric heaters and throttle-position sensors used on the standard Bonneville. With this revised 270-degree firing order the America greets you with a more ‘lumpy’ cruiser style note, unfortunately the standard slash-cut twin pipes don't do it justice, investing in a set of Triumphs 'not for road use' silencers will definitely increase the tempo though! Like any purpose-built, dedicated cruiser, the America is an unashamed offensive on the Stateside cruiser market, it wouldn't be the real thing if it didn't come with a huge range of accessories. Prospective owners will not only have the choice of four custom paint schemes, but also three different screens, three seats, nine luggage options, loud silencers, 11 chroming extras, footboards and 14 'other' products! Our test bike seemed to have all of these already fitted, what it does for the overall weight of the America is unknown, but the construction of some of these accessories can only be put as substantial, I don't think that they would break in a hurry!! The Bonneville America starts life at a not so light 226kg, with the accessories on our test bike I would estimate that it came in at around 245kg, yet riding it at any speed from traffic crawls to cruisin' down the highway it always felt agile and easy to manoeuvre. Left foot forward (it's a long reach! ), light pull on the smooth cable-operated clutch lever, select the first of five gears and off we go. With a seat height of only 700mm you sit very low in the bike, and with the semi pull-back bars at 875mm wide the riding position gives you total control of this rather large motorcycle. With a 33.3-degree rake and long 1655mm wheelbase, the ride on the America is as you'd expect - very casual. Add that to the light controls, and this is one bike that's not going to test you too much, although I was impressed with the ground clearance and the occasional margin for some slightly more spirited riding. If the mood takes you, you can make full use of the rear tyre and scrape of the footboards on some corners. The suspension is traditional cruiser, with 41mm front forks and chromed twin rear shocks in charge of the bumps. The feedback from the rear was a bit vague and almost felt like the front wasn't connected to the rear, but after checking the rear shocks and finding out that they were on their lowest setting (soft) I wound them up on the preload by three notches (5 available) and it improved the overall feel enormously. Braking is more than adequate for cruising duties with the same setup found on the Bonneville. A 310mm single front and a 285mm at the back both having Nissin two piston calipers. Cruisers nowadays have an amazing range of wheel and tyre combinations, and the America has added to this with its own unique combination. On the rear we find a wide 170/80-15 Bridgestone touring tyre, and up front is a skinny 110/80-18, again a Bridgestone. Though the tyres are unimpressive, they do provide reasonable traction and grip in the dry, if you ride when its wet then I would recommend some better tyres to provide peace of mind. Sat on the side stand, the Bonneville America is a particularly good looking bike. It stands out from the usual Japanese V-twin clone with its distinctive parallel twin engine. The large 17lt tank with its traditional ‘Bonneville’ two-tone paint and large Triumph badge, comes with a deep-chromed console on top. This is a direct throwback to the Triumph motorcycles of the 30’s and 40’s, but nowadays this console is used to house the warning lights and the fuel cap. Other nice touches are the chrome air filter covers, and the replica toolboxes behind the passenger pegs. The headlight and large faced white speedometer are finished in deep chrome, it unfortunately does not come with a tachometer. The exhaust pipes are all new, double skinned to combat the “blueing” of the original Bonneville pipes. These are attached to long slash cut silencers to suit the 80dba limits of the USA, very quiet indeed. As I mentioned earlier there are some Triumph pipes available which are shorter and louder, install a jet kit at the same time and you will no doubt get some healthy horsepower and torque gains as well. Some British bike traditions, like oil leaks, strange electrics and big vibration problems have been left to the past. The smoothness and build quality of the new Bonnevilles, and in particular the America make it a much more viable alternative to the somewhat similar looking Japanese mid-range cruisers. British bikes have always been keen on turning corners, and just because this one looks, and is a serious cruiser, and it's named after a country where they speak rather 'odd' English, that doesn't mean that it's forgotten its heritage though. The America quite easily outclasses all other 800 cruisers when the road starts to twist and turn. The steering is light, it turns in more quickly when you ask it to, and there's a lot of room under the America to lean over than any other 800 cruiser on the market. Quite simply it probably has the best chassis performance in its class. 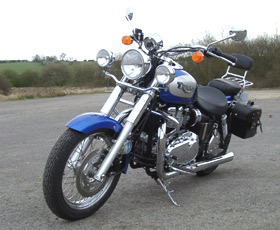 Buyers attracted to British handling qualities, or riders who simply want to be different will love the Bonneville America, it turns heads in a way that no other Japanese cruiser will do, it has style and heritage and is undoutedly a true piece of British iron. You have to congratulate the people at Triumph when it comes to the Bonneville America – it does exactly what it’s meant to do. This bike is magic on the streets, and I don’t mean handling-wise. If you look at the handling from a performance point of view, you’ve got it all wrong. This bike is far from performance, it’s all about presence, the presence on the streets. Get on it and you feel that this bike is big, the first time I had to put first gear in, I had to move forward on the seat. When you start her up, she sounds just right, not refined like a new highly tuned Japanese bike, but still not “old enough” to frighten you off with unwanted rattles and shakes. The right vibrations, the right sounds. Pull the clutch and “clonk-in” the first gear and again, you feel what this bike is all about. Triumph has made it do the right thing at the right points. When you ride this bike around town, people really look at it, it is an amazing bike and few people can resist staring at it. I’m surprised that nobody got hurt, either injuring their neck or walking into something (like a lamp post, or their own jaw). Cruising at 30mph in the top gear down the high street is an experience. Open up the throttle and she tugs away steadily, just like she is meant to do. In standard form the pipes are a bit quiet and don’t let the true spirit out enough. I’m sure that most owners will cure this. Out of town, she will happily do 70mph in an easy one-hand-at-the-bar-all-American-outlaw-biker kind of way. When you pull up and turn the engine off, you’ll be greeted with that “right-stuff” again, she huffs-and-puffs a bit when you switch the ignition off – and the key is, of course, situated under your bum, not at some modern place like the handlebars. Many bikes attract people when parked, but this one is in a league of its own. People come into the car park and see you preparing to leave, and the stick around till you’ve gone tug-tug-tug away. At one point an older gentleman almost fell into tears when he saw the America, he just kept stuttering, “It’s so beautiful” and “I used to own a Bonneville”. If you are after a cruiser and you want “the right stuff”, but you’re a bit fed up with that “Harley-is-the-only-real-bike” gang, then I think you have a definitive winner in the Bonneville America. It could have a bit more grunt, and this and that, but that is really missing the point of this bike. It’s all about the presence – it is impossible to not look. 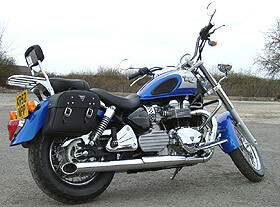 Read external Triumph Bonneville America reviews on Ciao.